The main shock for me is the reaction from the fans to this game. So many Arsenal Fan’s losing their sh!t over the fact we got destroyed by a team who are far superior to ourselves at present. I don’t want to continue to go over the same points but in this instance I feel I need to once again bring to light some key points. Gibbs, Iwobi and Gabriel are Championship Level Footballers at present. Ozil no longer has interest in being at the club. We are no longer a top 4 team, we have to accept that our best hope is now Europa League Football. The fact that we tend to play Bayern Munich literally once a season at the moment and the foundation to their destructiveness hasn’t really changed (Lahm – 33, Robben – 33, Lewendowski – 28, Ribery – 33 – I know he didn’t play last night) but we still don’t seem to know how to set up against them is embarrassing. But why should we expect anything to change? Our side is on the decline. How Gibbs started after his performance at the weekend is beyond me? And up against Robben was a recipe for disaster from the start. We were absolutely dominated from start to finish. The real question now is what we do in the second leg? We are 5-1 down on aggregate and have a 4 day break before our following fixture which is a must win against Liverpool? Send out the reserves? But if we lose 7-0 at home to Bayern then Wenger would be lucky to leave the stadium alive? Win 2-1 and pick up two injuries and lose 4-0 to Liverpool then again Arsene would be lucky to leave the stadium alive. I hope and pray that we don’t lose to Sutton as I genuinely feel like the Emirates will be burnt down if we do. So is 9-1-1 a legitimate and usable formation does anyone know? And I hope that the brake pads have been checked on the Bus we’re planning on parking this evening? The bright side is that Barcelona were absolutely ran ragged last night by PSG last night so that will be the result everyone talks about for weeks to come. Fair to say we are massively up against it, our Poor Winter form has shown it’s face once again and we’re going in to this game off the back of some unconvincing displays and with the form of our two superstars being questioned. We have to go there tonight playing on the counter attack, the speed of our breaks will be everything and parking needs to be accurate for us to stand a chance of getting an away goal. I presume we’ll set up something like the below. We’ll need big displays from Walcott and Ozil this evening. We can’t afford to be carrying anybody and we need to shut Lewandowski out of the game. 15 Goals in 20 appearances is a fantastic return and with Ribery out and Robben becoming an ageing threat I think if we manage to shut Lewandowski out then we could stand a chance of taking a good result back to the Emirates. Vidal and Kimmich will probably look to disrupt Ozil wherever possible but hopefully it doesn’t lead to him getting his head down and disappearing from the game. All in all it will be an interesting game and I can imagine most of the starting XI having a break until the 04th March after this one. So no reason to not give 150%. So we’ve turned a corner? Hardly, if anything we’re stuck on a roundabout. We got very lucky against a Hull side who credit too them seem to be heading back in the right direction. On another day we could have been 3-1 down after 30 minutes. Gibbs was absolutely dominated down that left hand side by Markovic who in my opinion was probably Man of the Match. Niasse is still finding his bearing’s which is understandable as it was only a month or so ago that I saw him turning out for the Everton Under 23 side. However he could have had a brace after missing a handful of clear cut chances. That said I believe that we once again massively under performed and if we take that 11 into a game against Bayern then it could be incredibly embarrassing return to the Allianz Arena. Ozil was running around like Bambi, Sanchez was snatching at chances which are usually bread and butter for the Chilean and Walcott disappeared leaving Bellerin as our best attacking and defensive offering down the right hand side. How Iwobi was gifted 82 minutes of game time baffled me. The introduction of Perez for 8 Minutes was questionable, especially considering it was Perez’s persistence that got us our second goal of the game? Why he and Welbeck were not introduced with 20-30 minutes of game time remaining is beyond me. 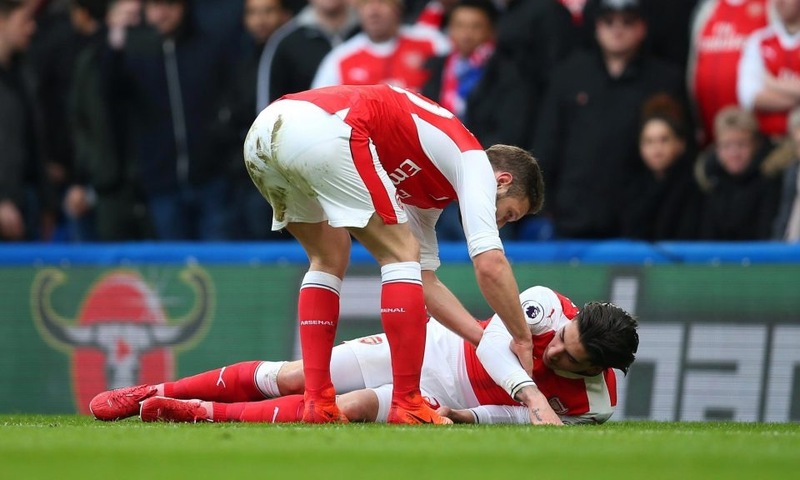 Gibbs should have received a straight red for his audacious challenge and we were slightly fortunate with our Sanchez’s goal however we have been on the receiving end of those decisions on numerous occasions so please accept my unapologetic stance with regards to that decision. So what do we do on Wednesday? I believe the Floodgates have been well and truly left open and up against a side that could potentially win the Champions League I am on incredibly nervous Arsenal Fan right now. Where’s Adams and O’Leary when you need them? Hull City are on what on paper looks like a decent run off the back of a Draw with Man United and a win against Liverpool. Personally I don’t believe they offer much in the way of threat and their previous results are a bit of a smokescreen to what is now a very poor Hull side. Having lost arguable their best player in Snodgrass and with Hernandez and Dawson battling with Injury I don’t think they offer anything that we need to be concerned about. Their result against Man United was a back’s against the wall display in a game where united dominated most of the possession and same again against Liverpool. Liverpool took the lion’s share of the possession and were a goal down until they were caught on the counter whilst trying to get back in the game, Liverpool don’t forget are now 5 games without a win so they also are struggling for form. I don’t think we have any excuses here, personally I’d like to see the likes of Perez and Walcott on the pitch against a side that will try and sit back and hope that we will struggle to break them down. With Sanchez as the Lone Striker with Perez and Walcott either side we have a front 3 that can rotate throughout the game. Make it difficult for the defensive line and I believe that with the creativity that Ozil, Sanchez and Perez have we won’t struggle to get in behind. If we get an early goal then we could be in for an absolute Goal fest, our last 4 games against the Tigers have seen us score 11 goals and we have conceded only 2. I believe Perez would make all the difference in this game and I’ll be disappointed if he is not chosen in the starting 11. 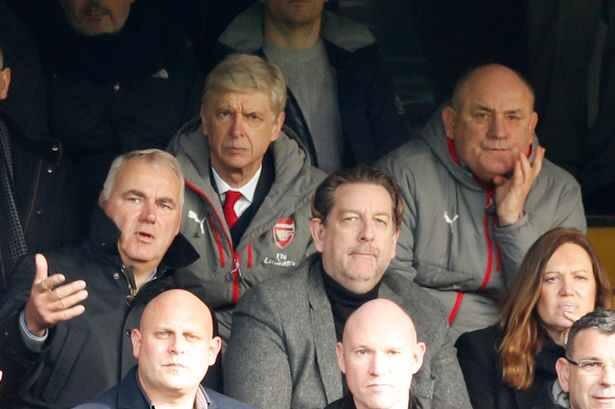 Arsene remaining positive is what the fans would want to see I guess, however we have to remain realistic as we see out the rest of this season. We have 14 games remaining and we have to face Liverpool, Man City, Spurs and Man United. Chelsea have 14 games remaining and have to face Man City and Man United. Realistically both teams should be winning all of their remaining games however we’ve seen how unpredictable the league is this season. Consistency is everything and as you can see in the below form tables, we are not challengers when it comes to current form. We have a game this weekend which allows us to start up a bit of momentum once again but our following game is Bayern Munich away. It’s the question that Arsene must be asking himself a lot now. Arsenal fans seem to be of the opinion that he’s had his time and it’s time to move on. I am now at a point where I’ve also joined the bandwagon. I think we have to look at whether we’re happy with what we’re getting from the club. Being a top 4 club is fantastic but there has been no progression. At the beginning of each season I think most fans could predict that we’ll make top 4, leave the Champions League early and have a decent domestic cup run. But that’s not enough anymore, I think we need to be realistic and understand that whoever comes in probably won’t win anything for a couple of seasons. It’ll be a painful trainsition but as fans and as a club I think it’s needed to become title challengers again. Another weekend to forget. A short trip across London to play a team who will without doubt will walk away with a league title. I think this season as a whole (not just for Arsenal) is based around having a Plan B. As a team we only have one game plan, possession based Football and wait for the opening. Once teams get 11 players behind the ball and don’t let us break them down we become frustrated and boring. We look confused on the ball and tend to clutch at straws. Why will we fall out of the top 4 this season? Because Man City have made a major signing that have given them a new dimension and they look incredibly strong. Man United have multiple fallback plans, they can go long ball to Felleni or use the pace of Martial and Rashford. Then we have the noisey neighbours who look solid, very solid this season and I believe the only saving grace we could have is an injury to Kane. Southampton fielded their Youth Squad against our Reserves. Their Under 23 side which of course any Premier League side would have destroyed. We cannot accept that as the foundations of a Squad to face the Premier League favourites. Naivety is one thing but stupidity is a whole different ball game.